Law 11, commonly known as the offside rule, is a rule that occupies only 1 page of the official IFAB Laws of the Game. Although simple and brief in appearance, its application during a match can be quite challenging. In this post, I will explain the various nuances of this law so you are better equipped to understand and apply the law. In the section titled: Interpretation of the Laws of the Game and Guidelines for Referees, a few terms in the context of the Offside law are defined. According to that guideline “nearer to his opponents’ goal line” means that any part of a player’s head, body or feet is nearer to his opponents’ goal line than both the ball and the second-last opponent. The arms are not included in this definition. Figure 1: Ronaldo’s head is in an offside position. Since he could have scored with his head, Ronaldo is in an offside position.. Multiple players could simultaneously be in an offside position as shown in Figure 2. 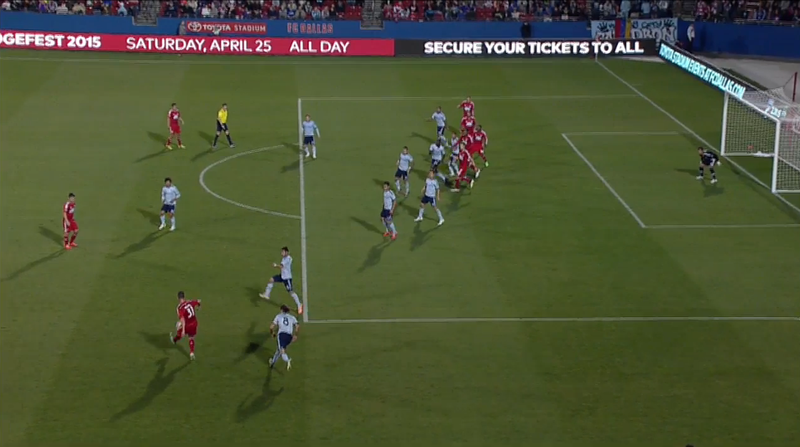 Figure 2: 5 FC Dallas Players are in an offside position.. The time of significance is when the ball is played (passed by a player of the same team) and not when it is received by the player who is in an offside position. This is the moment when an assistant referee needs to take a snapshot to make an accurate inference. A player could be one moment in an offside position and within a subsequent moment be in an onside position. The assistant referee needs to keep this in mind and reconsider as appropriate. What does the ball touches or is played mean? It means that the ball is kicked or headed or played is any way that is allowed by the rules of the game. In other words passing the ball by hand, while the ball is in play, wouldn’t count as playing, since that would lead to a “Handling the ball” foul. In addition, three types of restarts (a goal kick, a throw-in, and a corner kick) are explicitly excluded. Note that the ball touches or is played by one of his team and not an opponent. This means a player in an offside position receiving a ball from an opponent is not subject to an offside offence rule. Watch this video (from beginning to 1.50 mins) to see real life situations where it’s not an offside offence because the ball is passed to a player in offside position by an opponent. One must also clearly distinguish between a deliberate save by a goalkeeper and a deliberate parrying by a goalkeeper. The US Soccer site defines “Parrying” Versus “Saving” as follows: The concept of “parrying” is still in the Law; however, parrying is no longer seen at the higher levels of play, because it is no longer an effective tool for the goalkeeper, who has only six seconds to distribute the ball after achieving possession. “Parrying” should not be confused with making a “save.” “Parrying” occurs when the goalkeeper controls the ball with the hands by pushing it to an area where it can be played later. By parrying the ball, the goalkeeper has done two things simultaneously: (1) established control and (2) given up possession. The ball is now free for all to play and the goalkeeper may not play it again with the hands. Referees must watch carefully to see that the goalkeeper does not use a parry (disguised as a “save”) in an attempt to hide the fact that he or she has established possession. This means that a player in an offside position not actively playing as per the above definition should not be penalized. The assistant referee is in the best position to judge an offside offence. Once he infers an offside offence, he raises his flag and indicates to the referee to stop play. Unless the referee is sure that the offside offence call is incorrect, he blows his whistle and the play is stopped. The assistant referee then indicates the position of the offside offence by the tilt of his flag. Watch the video on Assistant Referee Signals to learn more about the flag mechanics. In the event of an offside offence the referee awards an indirect free kick to the opposing team. The indirect free kick is taken from the place where the offside offence occurred. Armed with all this information, you should now be able to assess offside position and offside offence correctly. Remember that practice makes a person perfect! The more you actively apply your learnings to real situations, the more you are likely to understand it well. Would love to hear if you found this post useful or if you found errors in it. Please chime in with your thoughts and comments.